Here are some new pictures of our African drumming group 'Kassa!' performing at the University of Nottingham International Students Welcome Evening. For the fourth time running we have had the enormous pleasure of providing a big open drumming workshop for their students, followed by a high energy evening performance. Each year both events just seem to get better and better! The drumcircle workshop was amazing! University of Nottingham certainly appear to host the cream of talent from around the world. Some of those students are brilliant drummers! This year the performance was one of those gigs where everything seemed to work - the accoustics were perfect, the atmosphere was joyous and, what's more, the audience were up for dancing! 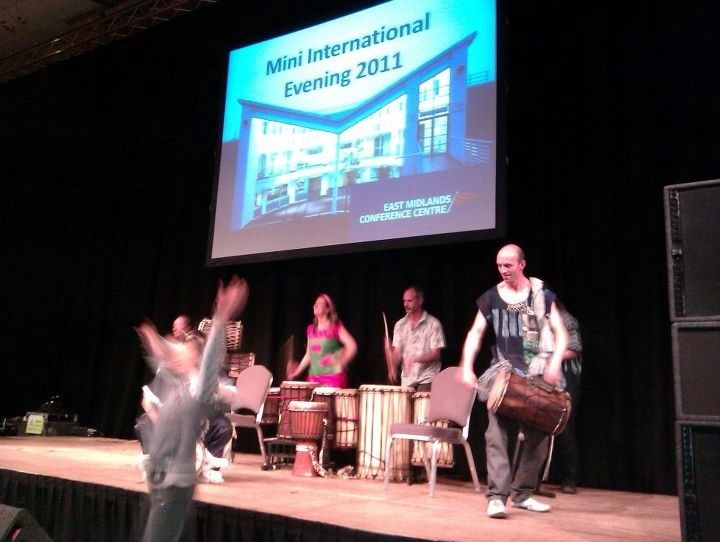 African drumming and dance performances in Nottingham, Leicester, the East Midlands and beyond. Next year we will be headlining the event and we can't wait!